Last year I released my second studio album 2000 Years Ahead, my the most successful release to date. Success shows in different ways: followers’ growth, bookings, smiles on the dancefloor. But today I’d like to share specific numbers, and that is how I earned on the album sales. Just in time as I recently got a financial report from the label. The album was released in two formats: digital and physical. Label — Digital Om Production. At that time Bonzai Music was taking care of the digital distribution, whilst Arabesque Distribution for the CDs. For the first quarter, people downloaded 940 tracks and purchased 140 CD copies. “2000 Years Ahead” in the top sales charts. Source: bptoptracker.com. Overall, the album spent 18 days in the top-10 and 69 days in the top-100 on Beatport. Sitting in the charts for more than two months considered as quite an achievement. Now comes the more interesting part. To be clear, all numbers below are net, i.e. after the deduction of the stores and distributors commission, which is roughly 50% depending on the platform and region. For example, when you see $1,99 retail price per track on Beatport, the real income from it is about $0,9. That’s the numbers I’m operating below. A thousand and a six hundred euros sound nice, right? Now let’s calculate the profit: €1625 (revenue) – €925 (expenses) = €700. But we’re not done yet since all profit splits between the artist and the label — that’s a typical deal in the industry. So, then: €700 / 2 = €350. And that is how much I earned before taxes. Once again I’ve got a confirmation of my own words that a music producer cannot make a living on the music sales alone. I’ve written about it earlier and talked on my master class. Music release is not only income but also expenses. And whilst you may not gain profit at all, it will cost you something for sure. It’s important to mention that in my case the label took all expenses since we already worked together and I got a trustworthy reputation. Keep in mind that not every label would want to invest a thousand dollars if you are a new producer with a debut release. Perhaps, not everyone aware of that, but we actually have a problem in the music industry: many young producers expect to make a living on the debut release sales, then they see a financial report with a 2-digit number (or nothing, at all), start to accuse everyone around and eventually quit their career. I’m sad to see these things happen all the time and hence why I share my experience on how things work behind the scenes. I’d love to tell you that “I released my album and bought a house”, but the truth is after a year of hard work and a fantastic appearance in the charts, the album sales directly gave less than a monthly salary of a janitor. That’s the true story. That’s why you need to remove the pink glasses and start working hard — a something that musicians do not really like to do. And threat your music releases simply as a portfolio. A financial report is not only about the money, it’s also a lot of juicy data. I’ll put some metrics that I find interesting down below. 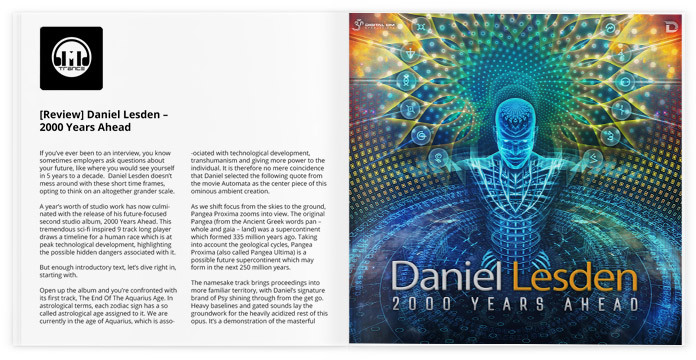 TranceMag staff editor Florin written a review of 2000 Years Ahead album, revealing hidden meaning of the tracks titles. If you’ve ever been to an interview, you know sometimes employers ask questions about your future, like where you would see yourself in 5 years to a decade. 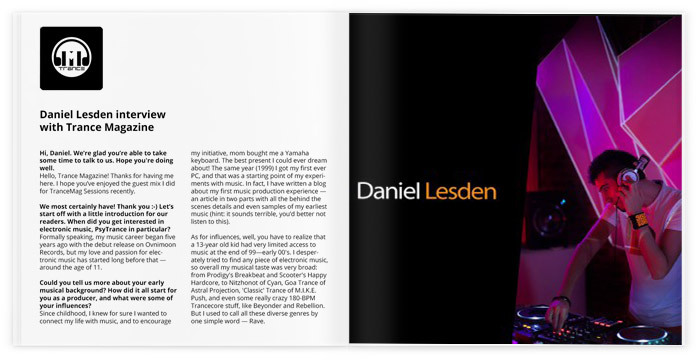 Daniel Lesden doesn’t mess around with these short time frames, opting to think on an altogether grander scale. A year’s worth of studio work has now culminated with the release of his future-focused second studio album, 2000 Years Ahead. This tremendous sci-fi inspired 9 track long player draws a timeline for a human race which is at peak technological development, highlighting the possible hidden dangers associated with it. Open up the album and you’re confronted with its first track, The End Of The Aquarius Age. In astrological terms, each zodiac sign has a so called astrological age assigned to it. We are currently in the age of Aquarius, which is associated with technological development, transhumanism and giving more power to the individual. It is therefore no mere coincidence that Daniel selected the following quote from the movie Automata as the center piece of this ominous ambient creation. The movie explores a future in which robots have taken over, and the struggles of mankind to stop the AI from altering itself. This first production from the LP has a slew of tech sounds infused into it, to further solidify its connection with the film. Antonio Banderas’ (who plays Jacq Vaucan) words fade, signalling the beginning of a menacing crescendo, which wraps things up nicely. As we shift focus from the skies to the ground, Pangea Proxima zooms into view. The original Pangea (from the Ancient Greek words pan – whole and gaia – land) was a supercontinent which formed 335 million years ago. Taking into account the geological cycles, Pangea Proxima (also called Pangea Ultima) is a possible future supercontinent which may form in the next 250 million years. The namesake track brings proceedings into more familiar territory, with Daniel’s signature brand of Psy shining through from the get go. Heavy baselines and gated sounds lay the groundwork for the heavily acidized rest of this opus. It’s a demonstration of the masterful control and quality of sound design we’ve come to expect from Daniel. Continuing on the path we set out at the beginning of the post, we get to The Dream Of Electric Sheep, and its subtle reference to humanity’s robotic counterparts. Clues for this are present at beginning (another quote from Automata, “Identify yourself” / “B-2206. Sorry, the city is not safe for any of us.”) as well as in the short breakdown. The Blade Runner quote “It’s a test designed to provoke emotional response” is particularly adept at emphasizing the relative rigidity of the AI in terms of ability to empathize. Contrast is underlined not only via quotes, but changes in pacing, especially on the baseline front, switching from a full on to a triplet pattern in key parts of the track. The pedal to the metal approach of The Dream of Electric Sheep accelerates our eventual arrival to a frightening future event. Further down the list is a track which you should know from the production announcement video released about 10 months ago. Technological Singularity highlights a more melodic side of Psy Trance’s overall sound, drawing its inspiration from a future event often called simply “the singularity”. In basic terms, it is the idea that artificial intelligence may enter a cycle of rapid self-improvement, evolving into a kind of artificial superintelligence and leaving humanity in the dust. Like the issue itself, the production is way more nuanced than it would appear at first glance, employing some lovely modulated acid lines throughout. The build-up is a particular highlight, with its almost Goa-like organic progression. Wonderful stuff. A familiar name greets us at number 5, Arrival, the teaser single which was released in December last year by the same lovely folks at Digital Om Productions. 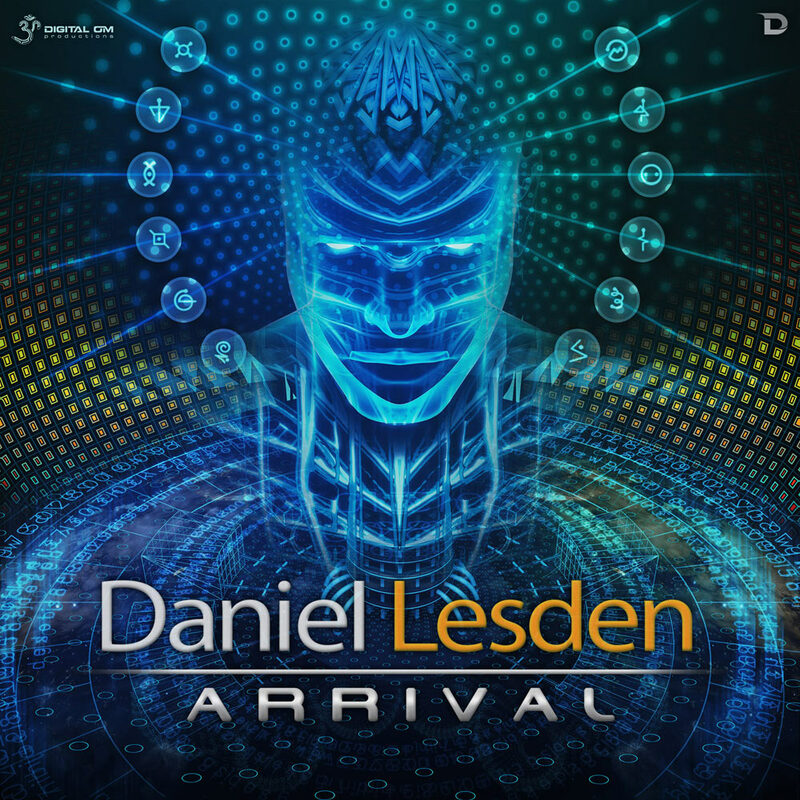 Taking the issue of ETs arriving on Earth as its main theme, Arrival opens up with a breaks-like layering, only for Daniel Lesden’s beloved blend of Progressive and Psy to replace it shortly after. With massive energy throughout and an addictive arrangement overall, this is not only my favourite of the 9 productions, but it can serve as an example of what the modern Psy Trance sound should be. Not only was the subject interesting, but the execution was top notch, as usual. It’s a fantastic package all in all, which comes from an artist whose familiarity with the Psychedelic sound allows him to craft some exquisite tracks. No wonder the album reached #1 CD on Psyshop, it bloody well deserved to. Sitting at number 6 is yet another fantastic Psy Trancer which you were able to hear in the album completion announcement video prior to the promo-blitz preceding the release. In comparison to the others, the Progressive side stands out a little more and the overall vibe is heavier. Once again, the bubbling acids and the build-up are of particular note here, due to the sheer attention to detail and masterful execution. Following in the footsteps of the wonderful Prog Psy number above, we find a collaboration with London-based producer AudioFire. A balance is struck between the two producers’ sounds, yielding a delightfully energetic, and ever changing piece, which is much lighter in overall vibe than its predecessors. It’d dare say that near the end you could almost mistake it for an Astral Projection track. It really is that good. After a subject as ethereal as the sacred space, Daniel plonks down a mammoth base driven Psychedelic slab called Machinery. Employing plenty of gated sounds and delicious modulated acids, track number 8 also sports one of the most distinctive secondary acid lines of the entire bunch. I’ll only say it’s near the middle, but you’ll definitely recognize it instantly. Terrific stuff. Closing proceedings is Daniel’s take on the 2014 Middle Mode & Relativ collab entitled Divination. 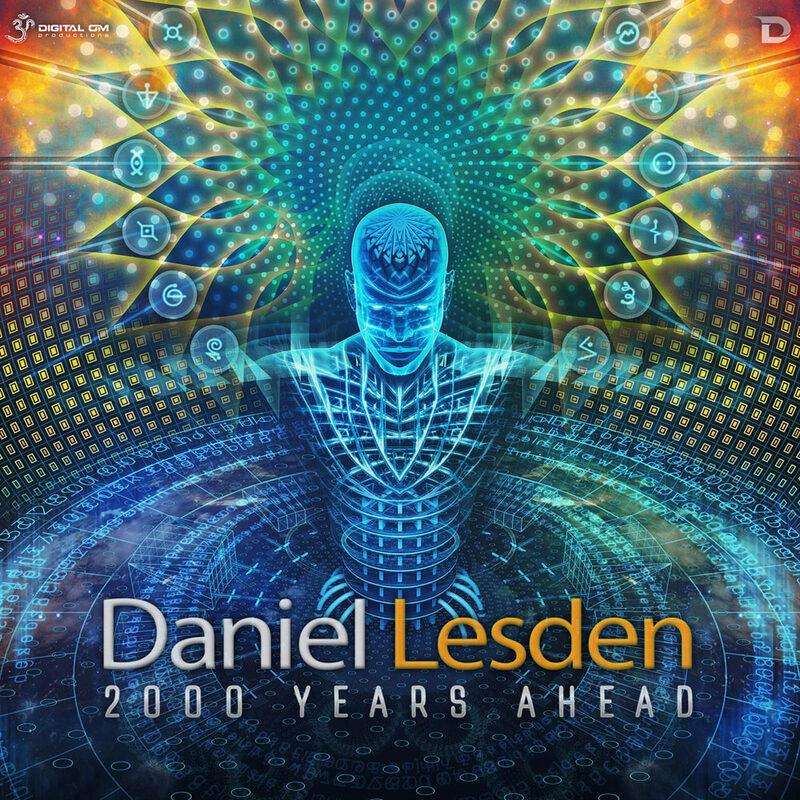 Despite using a similar approach to the original in the construction of his rework, Lesden manages to flip the entire atmosphere of the track on its head. 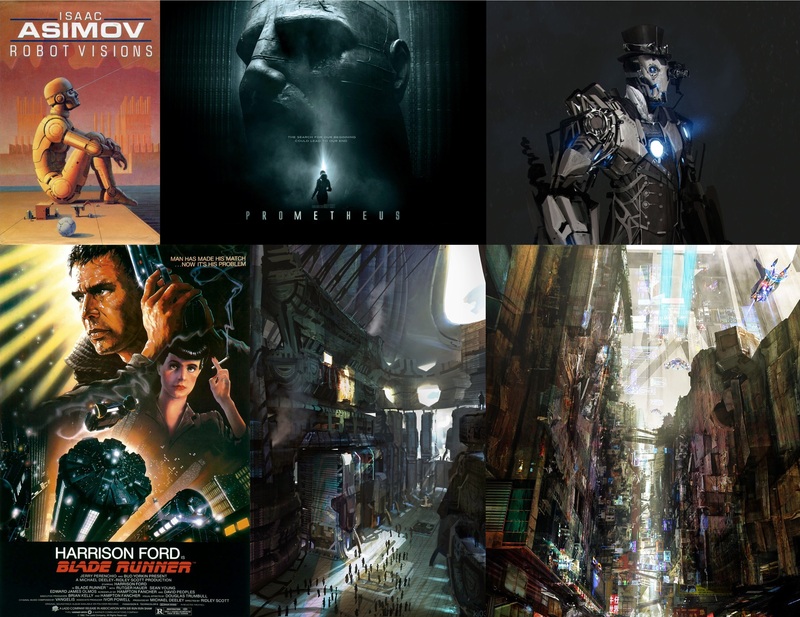 What’s more, the end result is a much lighter, more dynamic interpretation than the source material, while still incorporating the quotes from Porcupine Tree’s Voyage 34 Phase IV. The follow-up to Chronicles of The Universe (Daniel’s first album) shines as both a worthy standalone opus and as a part of the overall story arch. 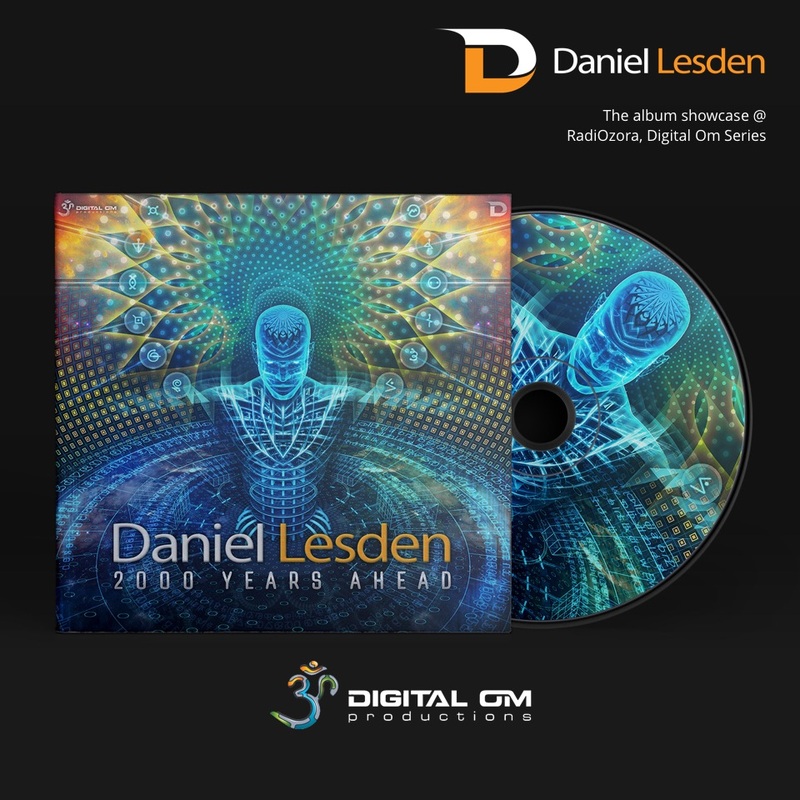 After his exploration of the universe, it made sense for Daniel Lesden to pick mankind’s technological end goal as the main subject for a second album. Not only was the subject interesting, but the execution was top notch, as usual. Though I personally lean more towards Technological Singularity, Arrival, Structured Chaos and Machinery as the highlights of this LP, there’s no denying the others are equally worthy of your attention. It’s a fantastic package all in all, which comes from an artist whose familiarity with the Psychedelic sound allows him to craft some exquisite tracks. No wonder the album reached #1 CD on Psyshop, it bloody well deserved to. We did it again! 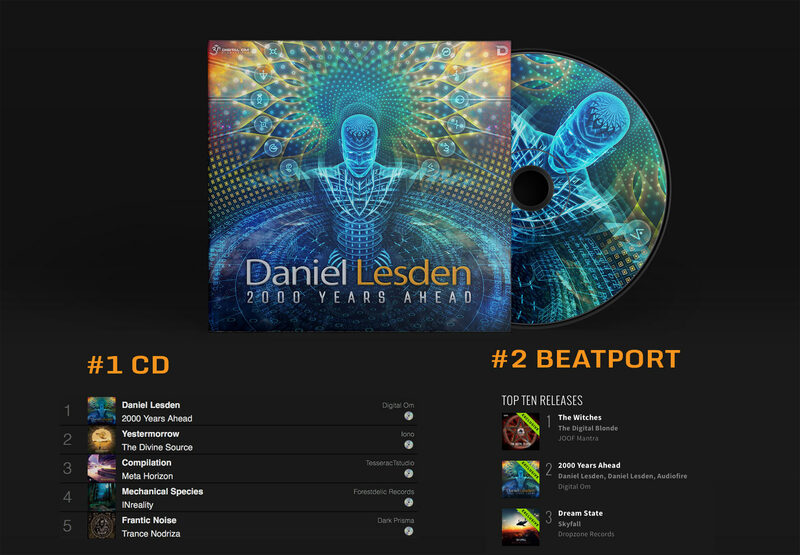 2000 Years Ahead album is #1 at top selling CDs chart on Psyshop. You guys rock! P.S. Not many CDs left in stock, hurry up if you want to get a copy too. Since I posted my second album production announcement followed by “the album is complete” videos, people keep asking me when it will be released, why it took me so long to make it, how I’ll call it, what inspired me, and more questions. Come closer my friends, make yourself comfortable and grab a cup of tea as I’m going to answer these questions and share some thoughts behind the creation of the album. In this fast-paced world, singles and EPs are the most common releases format. Well, no surprise: consisting of only one or two tracks, artists can make several such releases per yer and keep the buzz going. I’ve released a couple of singles this year too. Albums, on the other hand, are counter-productive on that matter: they take much more time and efforts to make, both physically and mentally. But I guess I’m an old-fashioned guy because albums are very special to me, it’s like an exam, a milestone that showcases artist’s progress. My debut album titled “Chronicles Of The Universe” was released in 2014, two years later after the very first release. It’s a musical story dedicated to our Solar System with each track representing a planet, and this album summed up my current taste and skills at the time. So around October 2015, having numerous releases after the first album, I thought it’s time to make a new album. It was so disappointing so I was about to abandon this idea entirely. I realized that I wasn’t ready yet — I wanted to make something fresh whilst my current skills held me back. But then something interesting happened. Now we have to go back in time for the three months before I started working on the album. On August 2015, I launched the advice section where I answer the questions people send me. Turned out, the advice blog that suppose to help other people, helped a lot to me too. Every time I answer a question, it forces me to dig deeper, to learn something new. Because knowing things is not the same as understand things and being able to clearly explain it to the others. To my own surprise, throughout the past year I’ve learned a lot of new things about sound design, mixdown, and other aspects of production simply by helping other people. How cool is that? Slowly but surely, the album progressed pretty well. But despite that I’ve improved my sound quality, one thing keep bothered me: the musical parts. I asked myself: “Does it matched the concept of a technological, aggressive, and futuristic sound like I wanted to make it in the first place?” Clearly, the answers were “no”. That’s it folks, I hope I answered your questions.